In the backcountry, every single element adds up. Every gram. Every calorie. Every inch. Every decision. All of these elements are multiplied during the winter. In this edition of Therm-a-Rest Beta, contributor Bethany Hughes gives us a few decision points to consider while camping in frigid conditions. We were five miles up the trail to Conundrum Hot Springs in the Maroon Bells-Snowmass Wilderness, when the snow and my blood sugar began to fall. 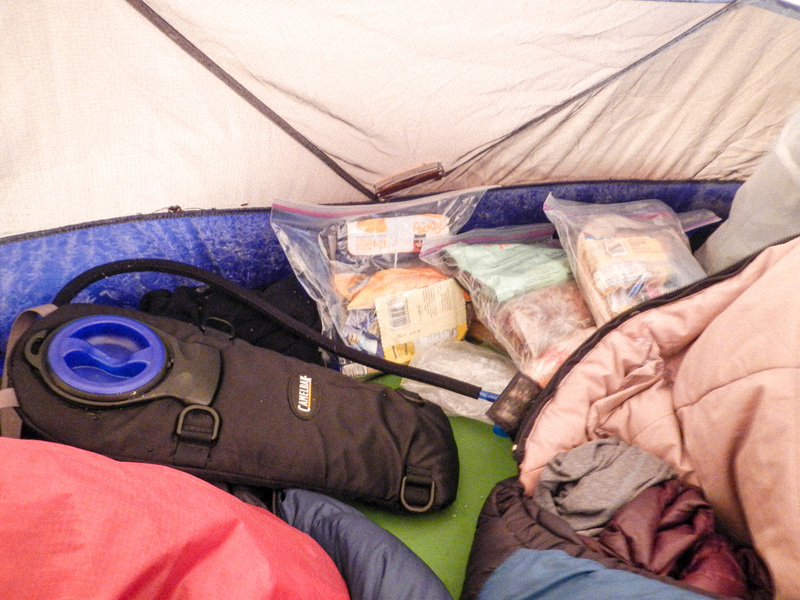 Amidst the excitement for my first winter backpacking trip, I had neglected to eat beforehand and all my food was packed deep in the bowels of my backpack, which may as well have been the recesses of outer-space as far as I was concerned. Safety must always be a primary consideration in the backcountry, especially when winter travel narrows the margin of error. Prior planning meant we had checked the weather and knew a storm was coming, while other lessons, such as always have a snack easily accessible, are more poignant when learned by experience. Winter backpacking requires more planning ahead, gear, and a few frosty lessons, the pay off in solitude, vistas and experience more than make it worth it. While Conundrum Hot Springs is packed all summer, we had the springs all to ourselves for two days through a winter storm. Putting a little extra thought into routine and simple practices goes a long way to making a winter trip more comfortable. I could have made my winter venture easier by: not only bringing snacks but making sure they are accessible while walking, taking an extra minute to choose the right campsite, keeping an eye on water supply, and sleeping well. 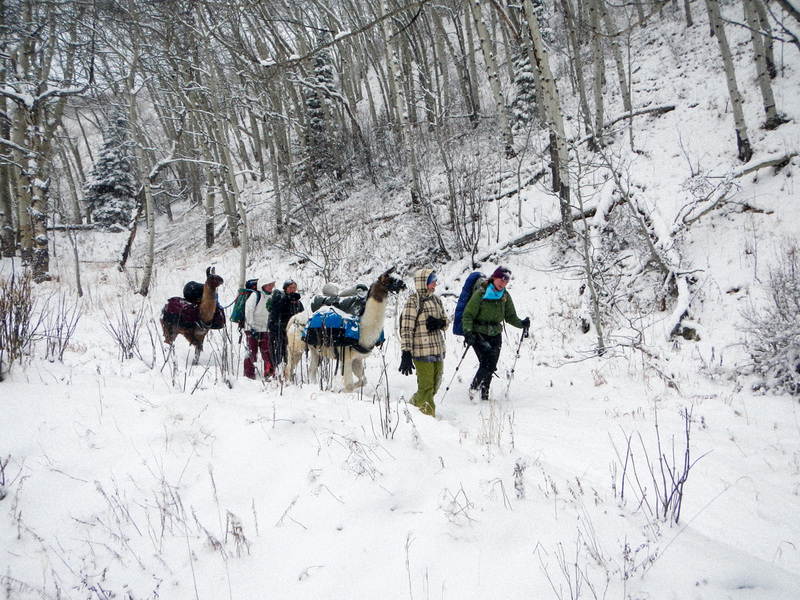 These are the key elements to a fun and comfortable winter backcountry experience. Whether you’re venturing out to ski fresh lines or lounging around, your camp is your base. Proper set up and maintenance can make or break a trip. Left to my own devices at Conundrum, starting off poorly by rolling into camp hangry and with my bottom layers soaked in sweat could have soured things, but taking a moment when we walked into camp to eat a snack and plan the campsite got me back on track. Before setting up, slow your roll and consider your options. When arriving to a potential site, stay bundled up, sip some water, eat a quick snack, and survey the options. Take your time, even in inclement weather, to select a good spot. Consider everything below, around, and above your potential site. As Leave No Trace teaches, don’t “make” the perfect site, “find” it. Make sure you are not only camping on a durable surface, also consider insulation and company. 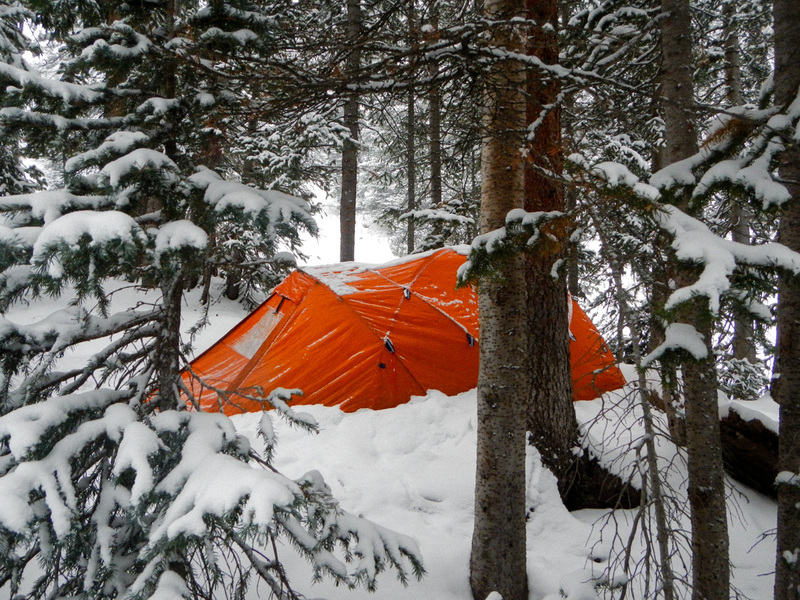 Snow is a great insulator under and around your tent but make sure there is still ample air flow. Snow also makes animal paths visible. Look for footprints so you know who the locals are, then set up out of their way. We pitched our tent away from the critter tracks and back among trees, which helped when strong winds came. What we could have done better was consider how that wind would form snow banks, tree wells, etc. Avoid setting up under a dead tree or limb and consider if a heavy dose of snow comes in. Where will it dump? The last thing you want is to come back from a day of playing to find your tent in a snow drift. 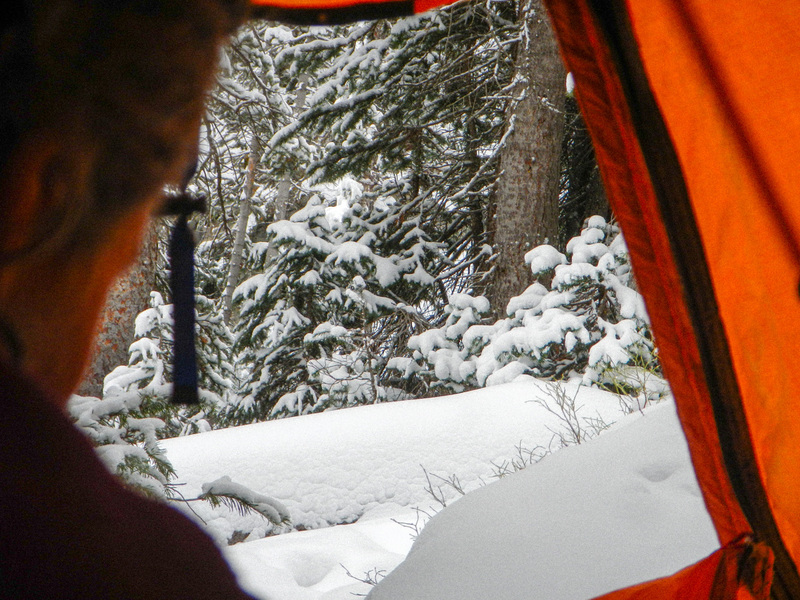 This is just one reason it is advisable to pack a backcountry shovel for winter expeditions. If you are skiing you should have one on your person anyway. 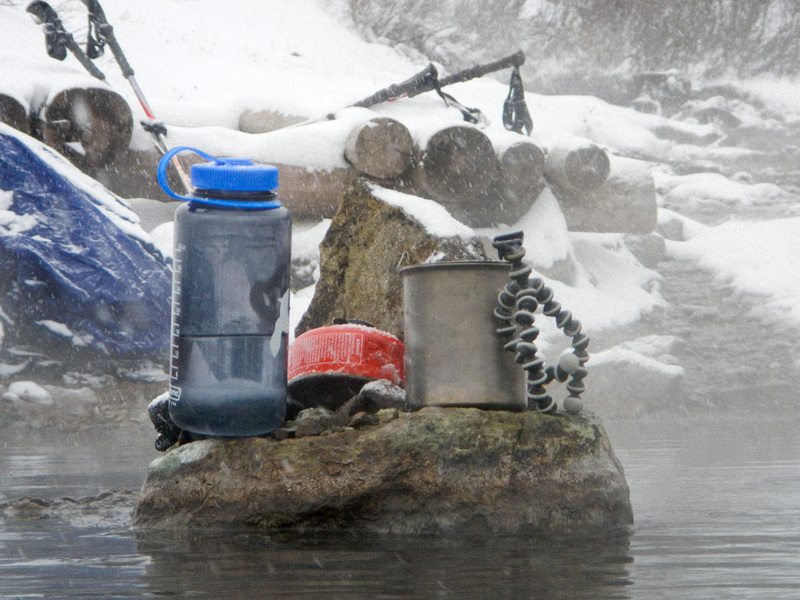 Water and hydration is among the most fundamental facets of any backcountry expedition. It is easy in cold weather to forget to drink but when everything takes more time and effort, as winter camping does, make sure water is conveniently accessible from the get-go. Set out for the day with the amount of water you need, track how much you are drinking, and drink plenty. One issue we ran into while at the hot springs was all the water in our bladders and bottles froze overnight. 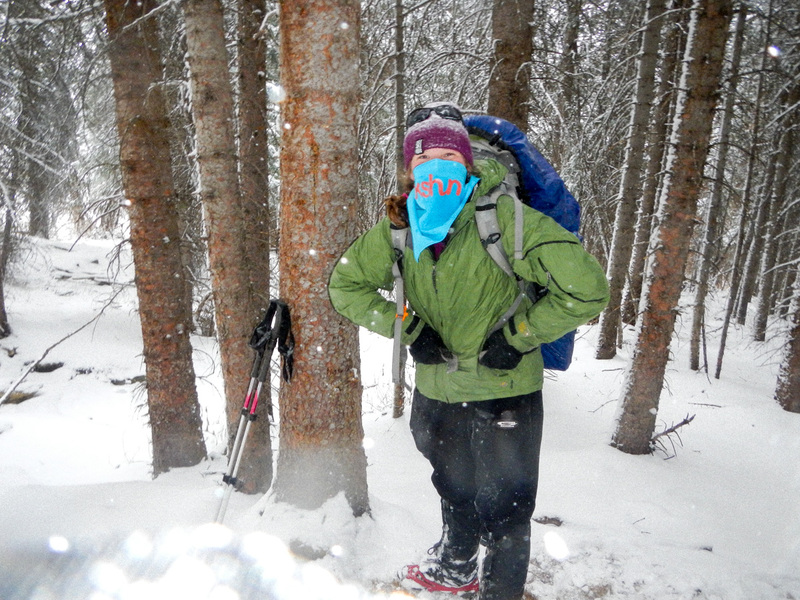 From then on, when winter packing I carry an insulated bladder which keeps water from freezing. If your hose is not insulated, blow a bit of air into the bladder after each drink so as to push the water out of the hose, that way it doesn’t freeze and block most of your supply. By the second evening, we had wised up and boiled water in the evening, which proved to have many applications and benefits. A hot drink before bed is always a boon. Putting the rest of the hot water in a well sealable container and wrapping that in extra clothes you might want to dry through the night means warmer sleeping and dry clothes. Finally, it means melted water available first thing in the morning. Fundamental to this is to always have water on hand and plan ahead before running out. One common but time and fuel consuming technique for water in the winter is melting snow. Once you have melted an initial potful of snow, it will reduce significantly, then adding only a handful at a time most rapidly builds volume. *According to the National Outdoor Leadership School guidelines, water brought to a rolling boil is safe to drink. Sleeping well in adverse conditions can be difficult. 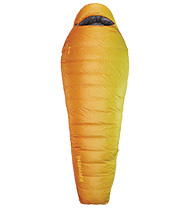 An improperly set up tent will sag or drip. 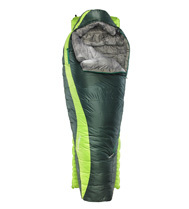 An insufficient sleeping bag will leave you awake and shivering. Not getting enough rest leads to exhaustion. Exhaustion affects decision making skills. Poor decisions lead to dangerous situations. Therefore, your sleep system should be a first consideration when deciding which kit components to upgrade for winter exploring. Since winter days are shorter, less light means our bodies are producing more Melatonin and getting less Vitamin D. These factors combined with conditionals, such as elevation and weather, mean you may feel more tired than usual. The best response is allowing plenty of time for rest. Resting comfortably means staying high and dry. 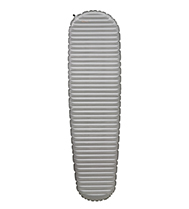 We’ve already talked about snow as an insulator and I always carry an inflatable sleeping pad in the winter for added warmth. Cold air means compressed air which means sleeping pads lose some volume over the course of a day, so before tucking in for the evening, top them off. That’s the staying high part, the staying dry part takes a bit more effort. Keep the space inside your tent dry. We used a trash compactor bag as a doormat in the vestibule for pulling off wet clothes like boots and socks so the snow which inevitably came with them did not get inside the tent floor. If footwear is soaked, pull the tongues up before going to bed to ease those brutal few seconds tomorrow morning when kicking into frozen boots. Keep essential gear, like evening layers and sleeping bags, away from wet gear and tent walls which may perspire. Before setting out for the day, push it away from the door to avoid accidentally sitting on it in wet gear when you get back. It is little things, like adding a bit more air to your sleeping pad, boiling down an extra handful of water, and taking an extra few minutes to figure out the right spot to make camp, which can make all the difference in your winter expedition. I walked out on a Friday, excited and trepidatious about what the winter storm would bring but the worst of it was getting hangry and sweaty on the way in. Sometimes a small, easily accessible snack and a little patience can help you enjoy something magical like backcountry hot springs in a snowstorm. 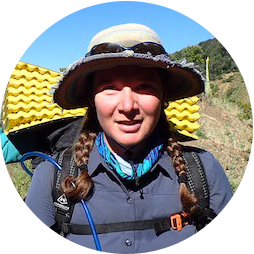 Bethany Hughes, of Her Odyssey, is 2500 miles in to thru-hiking the Andes of South America.